So here is a good and bad example of ripped jeans. Katie gets is right, but Lauren needs to retake a few sewing classes at FIDM, and she calls herself a fashion designer. umf. The December issue will be its last. After that, subscribers will receive Seventeen, another Hearst magazine. 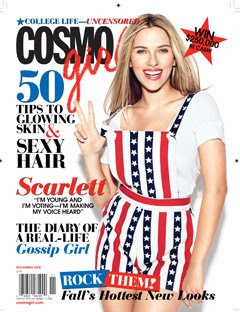 The company will continue to run the profitable Web site CosmoGirl.com. Nicole Richie will be releasing a jewelry collection with Mouawad. “The collection is targeted at girls in their teens to women in their 30s who admire her and the prices range from $30 to $150. Mouawad is aiming to put Richie’s pieces, which feature fabric, leather, silk strings, chains, rivets, feathers and gold-plated metals.” The collection will debut in the new Kitson store on Melrose when it opens in November and on ShopKitson.com. This gold-plated sundial ring with leather (pictured) was inspired by “African jewelry”.